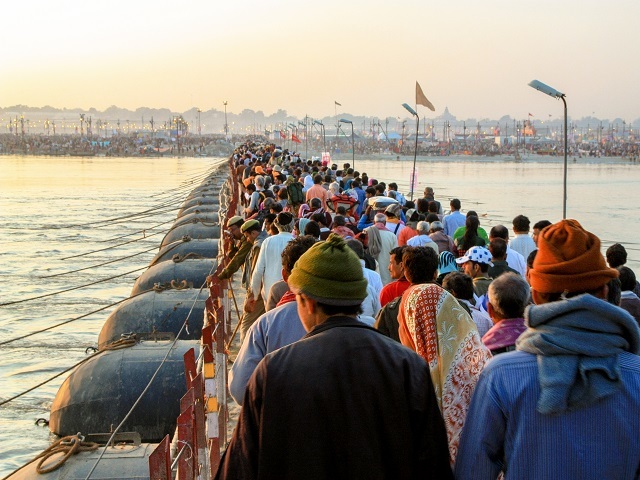 A spiritual gathering of millions of people in India, the Kumbh Mela can be considered a temporary urban environment and offers many fascinating insights for urbanists. Photo by AlGraChe/Flickr. In January, 2013, a city emerged on the banks of the Ganges and Yamuna rivers in Allahabad, India. Temporary bamboo and fabric structures appeared on a floodplain that had been underwater just weeks before. Metal plates were laid down for roads, pontoon bridges were constructed, and health facilities were erected. From January 14 to March 10, as many as 34 million people are estimated to have passed through the festival, which occupies an area larger than that of Athens, Greece. And then, as March came to a close, everything was taken down and recycled, not to return to Allahabad for the next 12 years. The settlement vanished. This gathering is called the Kumbh Mela, a Hindu religious festival and pop-up city like none other in existence. Beyond its magnificence and scale, Kumbh Mela has many lessons for urbanists on how to create and maintain a city that works for people. The Kumbh Mela has been called the largest gathering in the world. It is a pilgrimage destination that rotates every three years between the four cities of Haridwar, Allahabad, Nashik, and Ujjain, the dates determined according to Zodiacal calculations on the positions of the Sun, Moon, and Jupiter. The festival always occurs on a river or confluence of rivers where, it is believed, Lord Vishnu spilled a drop of amrita (the nectar of immortality) as he flew away from a battle. Pilgrims, at a predetermined time, wash themselves in the river to remove themselves of sin. In addition to the primary ritual of bathing in the waters, attendees also engage in devotional singing, a mass feeding of holy men and poor, and assemblies where religious doctrine is debated. All of these people, however, must also have water, food, and places to sleep. The gathering demonstrates exaggerated versions of the problems cities face, but has also been the driver of many potential solutions to these problems. The sheer size and temporary nature of the gathering make it an unmatched laboratory for urban planners and designers, who can watch urbanization (and de-urbanization) occur at a fast-forward pace. A team from Harvard closely documented the 2013 event from beginning to end, and has recently released their findings as a book. They highlight that the process is necessarily tightly controlled and administered, and planned for months ahead of time by a centralized team. The construction included 35,000 toilets, 340 miles of water infrastructure and 95 miles of roads, all in the duration of a few months. The temporary settlement takes the form of a planned grid, and has 14 sectors with height limits, dividing walls, and even gardens. The event has also become a laboratory for innovative tech solutions. Ramesh Raskar of MIT Media Lab, along with several partners at Ink, has created Kumbhathon, a movement which has engaged in several “Buildathons,” working with the government, private sector, and civil society in the city of Nashik (the next hosting city) to develop innovative solutions to the festival’s pressing problems. These solutions include cashless and smartphone-less payments for housing and services, bike-sharing, smartphone apps for navigation that show where crowds are thickest, crowdsourcing of location data to find missing people, and data collection to prevent the outbreak of epidemics. These solutions, while created to address the unique circumstances of a pop-up city, all have applications beyond the festival, both in other large gatherings and in everyday city life. The Kumbh Mela is remarkable for the devotion its attendees display. The rituals, the colors, and the music all contribute to a striking event. Perhaps equally astounding, however, is the fact that the gathering, despite its constraints, is able to function at a basic level, delivering necessities and services to people. The fact that solutions can be found even under these extraordinary conditions is a signal to other city leaders that they can foster learning and innovation under comparatively ordinary circumstances. They can take note of the Kumbh Mela’s progress, learn from it, and bring a bit of this ephemeral city home with them.